From emerging Israeli directors, brothers Yoav and Doron Paz comes an acclaimed award-winning film “Jeruzalem,” winner of the Audience Award and Best Editing at the recent 32nd Jerusalem International Film Festival. “Jeruzalem” follows two American girls on vacation who meet an attractive student studying anthropology during their trip to Jerusalem. A trip planned to be their best vacation ever, the girls, Sarah (Danielle Jadelyn) and Rachel (Yael Grobglas, Israel’s budding scream queen) do the rounds of the tour with newfound friend Kevin in tow and partying hard in Jerusalem’s ancient sites. The trio unexpectedly find themselves in the midst of a religious conflict followed by a series of horrifying biblical apocalypse. Inspired by a line from the Talmud that states “There are three gates to hell: one in the desert, one in the ocean and one in Jerusalem,” the movie unleashes a chain of demonic events that brought about terror as the three try to escape between ancient walls of the holy city. “We wanted to give the audience a chance to feel and experience this dark, mystical and religious city through the eyes of our characters. To see up close what the resurrection may actually look like, in the most reasonable place on earth to start the apocalypse,” says Yoav and Doron on introducing the film. The Paz Bros. are the sons of Israeli filmmaker Jonathan Paz (“Waiting for Surkin”) and grew up in Netanya. Their filmmaking careers began when they were around 10 or 11 years old. 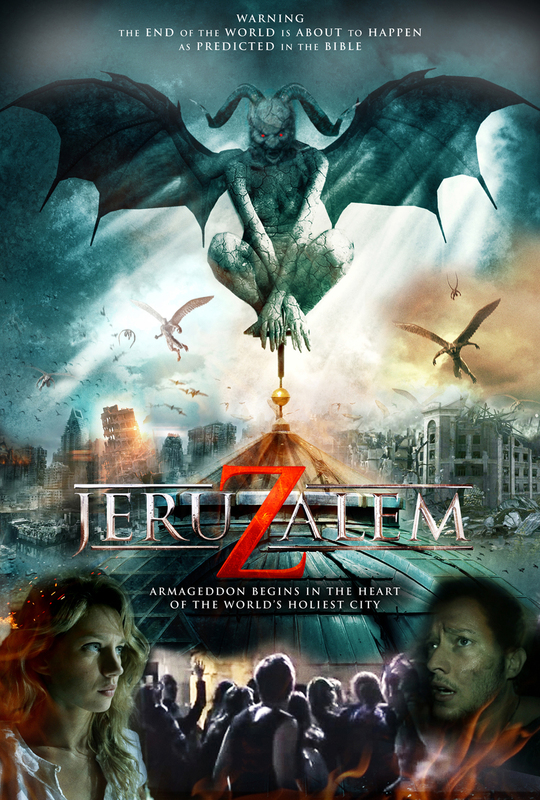 Filmed in found footage style through a smart digital glass, “Jeruzalem” gives the audience a rich detail of the city’s culture and history as read from the Bible. “We see it more of a POV (point of view) instead of found footage, we wanted it so all the other actors are talking to the camera, and when she crawls in the dark people the audience see how it feels to crawl in the dark. Like a sort of virtual reality. But we didn’t know what to do about it. Then a few years ago everyone started talking about Google glass with verbal technologly and this gave us our window. This also gave us another layer, a technological layer, where we could present more information. You don’t see it in the trailer, but the entire film is through a smart glass – not Google. So there’s verbal technology and augmented reality. This means we could use social media in it too as another form of storytelling. It’s the oldest story with new technology. We don’t like to call it found footage because, while it’s obviously a found footage technique, we think this takes it to the next level,” shares Yoav and Doron of their filmmaking style. Yoav and Doron Paz first gained acclaim with their arthouse film “Phobidilia,” an official selection at TIFF and the Berlin International Film Festival. Their latest film, “Jeruzalem” marks a radical new turn as they submerge themselves full-on into hyper-visceral horror storytelling. “For years we thought to ourselves ‘how come nobody did an apocalypse movie about Jerusalem’ , when it’s the perfect set up for it. You’ve seen movies about the apocalypse in cities all around the world: Bostin, then you have REC – everywhere, but nobody’s been dealing with Jerusalem itself. Though the bible, and its scriptures are set there, so that’s where we took it,” further shares Yoav on the concept of the movie.